There must be some explanation. Because there’s no one here. Not visible, anyway. Not in the streets. Not in the parks. Not resting in the shade of the reserves. No kids swing on the monkey bars. No old folk play bocce. No teenagers skateboard. No one walks their dog along the Monte Carlo reserve. There’s a community centre, but no community. A couple of dogs are barking behind fences. And is that the distant buzz of a leaf blower? A man commanding nature to withdraw? It’s an illusion. There’s no one. What about that roar overhead? A plane, on the flight path to Tulla. Cars, yes, plenty of those. Those hunched figures must be survivors of the apocalypse, sealed in radioctivity-free pods. As we walk north up Military Road, the traffic is a constant swoosh and thump, swoosh and thump. Drivers, intent on getting through, yack into hands-free mobiles, take instructions from their GPS. At the next intersection, put your foot down and keep on going. But we are on foot, hacking up the street like vagabonds. The few other pedestrians eye us warily. Their corner-eye glances say no one has a good reason to be on foot. Not here, not on Military Road. Not now. They are ashamed of their pedestrian status, but there is no feeling of fellowship, no happy band of wandering brethren. Instead their glances say What are you up to? Where are you going? Why aren’t you in your pod? Images from J.G. Ballard’s Crash haunt my imagination. If a car hit us it would keep going. No one would stop. We’d be left for carrion. Or for a passing garbage crew to toss our rotting corpses into the truck. Spooked by Military Road, we take a right into one of the new estates. Big houses. Very big, some of them. Two storeys, three storeys. Double garages. Columns, pillars, colonnades. High pointed railings. Balconies, statues, pencil pines. And well-tended gardens. Tended by one of the abductees, presumably. (Or alien replicants.) Well-mown lawns. 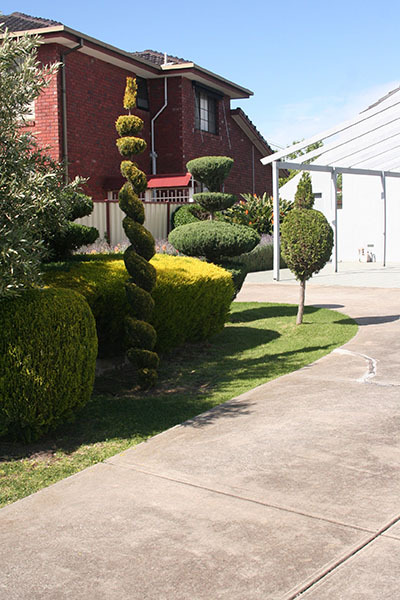 And the topiary! 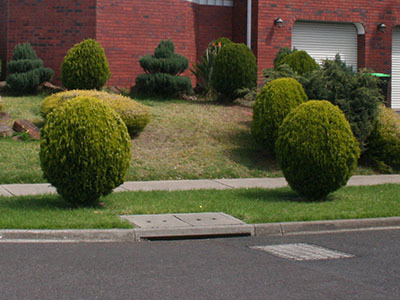 Never have we seen so many bushes trimmed into pleasing shapes. Does Apocalypse Heights have Australia’s highest proportion of topiarists? Or are they signals to the aliens, communications towers cunningly concealed? We walk along Templewood Grove in the still heat of Sunday. “It’s Self-Made Heaven,” my partner says. She’s right. Who would live in a place like this? No untidiness is permitted, none of the rambunctiousness of actual life. Houses here are not for living, they’re for display. Come here when you’ve made your pile, and want to show it off. Build a house that’s bigger than your neighbour’s, pencil pines that grow taller than his. Build a balcony for no one to sit on (that’s what the couch is for). Plant flowers for no one to look at (that’s what the plasma is for). We have landed in a theme park that purports to show life in the Melbourne suburbs in 2014. Apocalypse World. Dazed, we wander for hours among the pines, the topiary, the columns, the perfect lawns. We see no one, hear no one. And gradually, as we walk, our brains slowly begin to shut down. Our tongues thicken and loll. Our eyes glaze. Our feet slow, and our legs become weak. “We have to get out,” I say. Is that the answer? Some family has lost itself, rattling around the palatial rooms, everyone using their own bathroom. Between the plasma and the pines, a family has lost its soul. And that’s when they came, the aliens, in their pod-like spacecraft, communicating through those sculpted bushes. That’s when they spirited them up, the denizens of this suburb. Took them to a distant planet, to siphon off their DNA for advanced galactic technology. And what’s left here is lifeless husks. Empty streets. * The actual name is Avondale Heights. 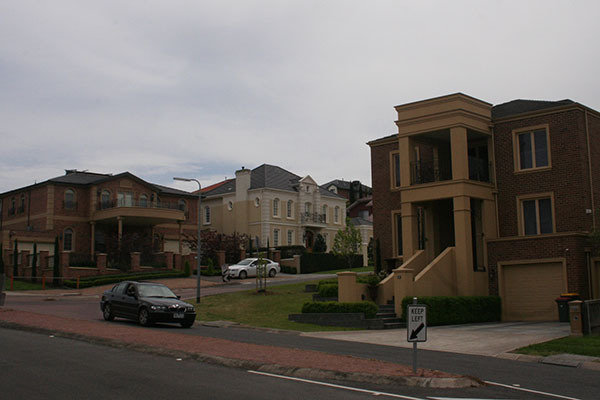 This suburb was home to two people who achieved celebrity: Matthew Lloyd, who played football for Essendon, and Frederick Valentich, who really was abducted by aliens. Maybe. This is funny because I was brought up in the ‘old’ side of Avondale Heights. Yes on the wrong side of the military rd tracks lay a 1950s time capsule of suburbia. As a boy in the 80s I had a ‘re occurring dream that aliens would land and knock door to door on Deutscher St to take all kids away to space. I’d wake to realise they left me behind and would be quite perturbed. Now that you have informed me that the aliens intact landed on the other side of Avondale….. I can finally have closure. Ha ha, I lived in Skewes street through the 1990’s. Military road sort of splits two quite distinct periods and two distinct societal groups. The old bit was post war workers and the new bit had a large number of ‘migrants-made-good’. That the gardens are well tended is probably indicative of the pride the owners have for their achievements and that they grew up in much more lean times. Go to somewhere like Williams Landing and you’ll see McMansions with gardens pretty much overgrown with weeds, and after only two years in existence.